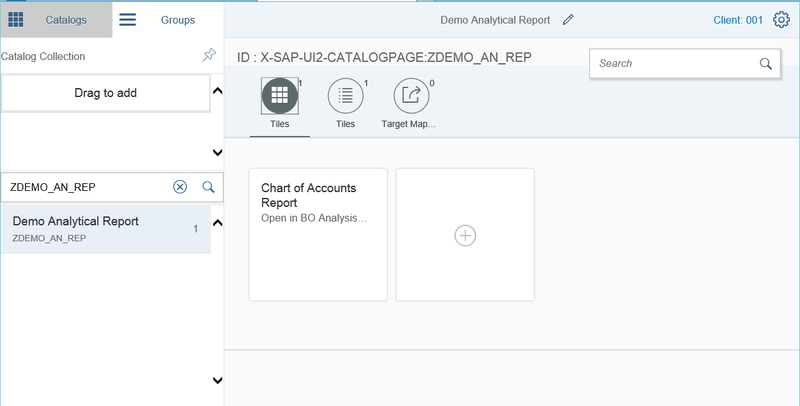 In this post I am going to show how to create Fiori Tile for Analytical query in case of S/4HANA system. Using this approach Fiori LaunchPad could be a single entry point both for transnational and analytical purposes. But using Analysis for Excel reporting client as simple and known to analyst user reporting tool. 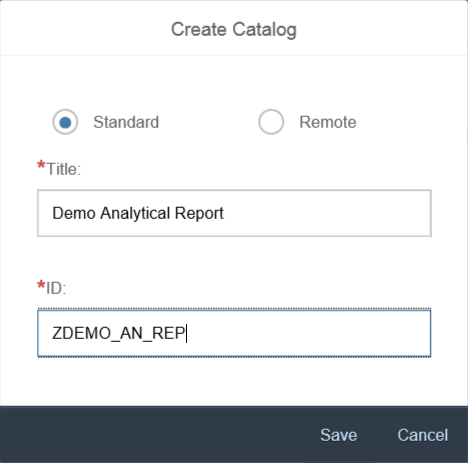 Create a Fiori catalog in t-code /ui2/flpd_cust at FrontEnd server part of S/4HANA system or use existing one. This is needed for accumulate Fiori tiles of analytical reports. Enter Title, Subtitle (in needed) and Target URL. Target URL should include server and port. You could find it when test a service in SICF t-code. Include analytical query technical name in URL. Save configuration and check that Fiori Tile now appears a catalog. 3. At FrontEnd server part of S/4HANA system create a new role in t-code PFCG or use existing one, assign Fiori catalog to Menu in this role. 4. At FrontEnd server part of S/4HANA system assign role to a user in t-code SU01. 5. Open Fiori LaunchPad at FrontEnd server part of S/4HANA system in t-code /ui2/flp or directly by browser link. 6. Add a new Fiori Tile to a Fiori group that you prefer by Editing Home Page. Now you could see a new tile in Fiori LaunchPad. 7. Open it. Analysis for Excel will be opened. You could make steps 1-2 for many analytical reports. To open report in PowerPoint part of Analysis enter POWERPOINT instead of EXCEL in Target URL. Depend of configuration you need to enter credentials, I am not expert at this area and could not explain details to configure. To make it useful for user create a Fiori group with this Fiori Tiles and assign it to role. In this case uses will see this Tiles in Fiori LaunchPad without step 6. Great post thank you! I tried the same but somehow only get a file called analysis.sapaox. Is this right? When opening this file with BO Analysis it ends with an error immediate but no details. Could you please confirm you also download these sapaox files first and then BO Analysis is opening the query itself? Are there any prerequisites I have to fullfil? BO Analysis version or BW release? I my case it also worked through a file, but open report correctly. 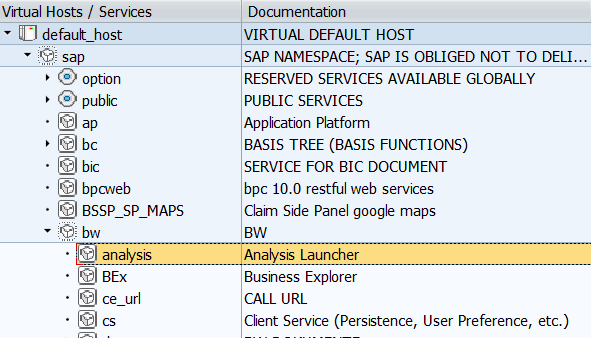 Analysis 2.3 and SAP BW release 751. Great Post . Thank you for sharing the information. As seen in above scenario we can only map ONE Analytical Query to ONE Tile. Due to this only one query can be tagged / opened in Analysis Office which is quite similar to hardcoding. I would like to know, is there any possibility that we can assign multiple Analytical Queries to Tile / Tiles and they can be open seamlessly in Analysis office ( similar to opening of Analytical Queries in SAP Design studio) rather than restricting to one tile. 1. 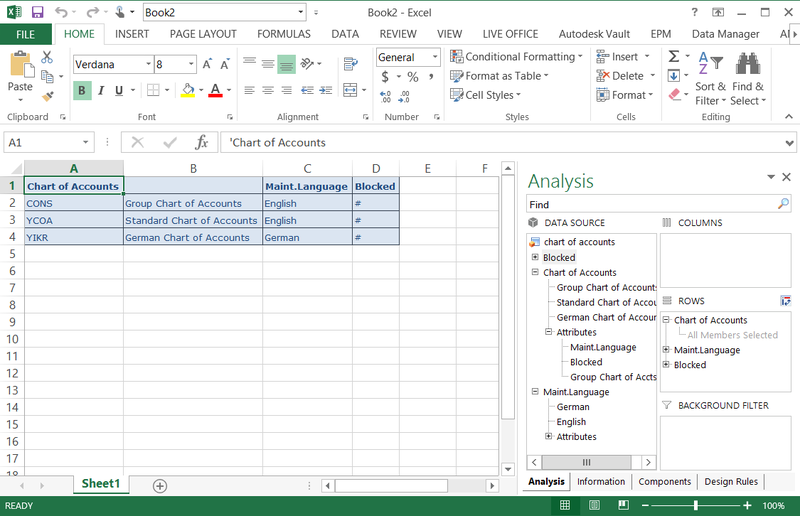 Create workbook, add there queries you need to open, charts, formation etc. Hello Maksin, Thank you for sharing the information. Is there any additional configuration to be done on the server or S4HANA side? I’m curious to know the other way round. Can I open any Fiori tile from an AFO report ? I had a security-related question related to custom Analytics query. How can we restrict access to custom analytics query that is run through query browser? A developer might publish a custom query in production. Anyone with access to query browser would be able to access the published query. Z_SDORDER_REP_UK is the Query I created. I am able to use this Query in RSRT in Backend. But when I click on the Tile, a file analysis.sapaox is downloaded. And when I start the file Excel opens, and then the Message: No Service Implementation is available appears. Hi! As I understood you create BW/BEx query – right? Do you activate service /sap/bw/analysis in back-end system where this query is placed? If no – activate it, test service and copy link with correct server port name and paste it to you Fiori Tile link. Is there a possibility to add the client as parameter to the url? In S/4HANA (1709 and above) you can create a URL tile using a separate tile definition and target mapping. It makes it easy to define additional parameters. is there also a blog how to do this? Btw these days in S/4HANA (1709 and above) you can also create a URL tile using a separate tile definition and target mapping. Advantage is you can assign a system alias to the http protocol/host/port combination so that you can change it as you move from DEV, to QAS, to PRD. It also makes it easy to define additional target parameters.